Smith & Loveless Pump Station Operating for 70 Years | Smith & Loveless Inc. The name Smith & Loveless is synonymous with wastewater pump stations. After all, since opening its doors in 1946, S&L has shipped more than one pump station per day during its storied history. But volume doesn't just tell the story. Words like efficient, safe, non-clog and quality distinguish the S&L factory-built pump station. And over time, we have seen how these attributes contribute to another key S&L hallmark: longevity. A testament to the long-lasting, dependable service provided by S&L pump stations, the first three stations ever sold by the company are still in operation after nearly 70 years of service. Today, the City of Salina, Kan. operates more than a dozen S&L stations. But it is these first three pump stations, installed in 1948, that fully illustrate the longevity and tremendous value that packaged S&L pumping systems can provide for municipalities and other end-users. These dry-pit pump stations—underground models that today serve a public park, residential neighborhoods and multiple business districts—have provided more than 65 years of dependable service with no major repairs (including no pump replacements). “Those first three stations have outlived everyone’s expectations and we have every reason to believe there will be many more like it for future generations to admire,” said Bob Durdee, Manager of Pumping Systems for Smith & Loveless. Key to the success of the early S&L pump stations in Salina (and around the world) was the company’s emphasis on innovation and engineering excellence. 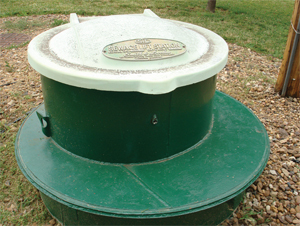 They combined unique non-clog pumps and custom-engineered enclosure designs, all pre-fabricated and manufactured with an emphasis on quality. That legacy continues today, both in the city of Salina and S&L's headquarters in Lenexa, Kan. Some of the first Smith & Loveless pump stations are still in operation, but the company continues to innovate and produce high-quality wastewater pumping systems. Check back in 2080 for more details.